All 22 episodes from the fourth season of the award-winning American comedy series set in the fictional 99th Precinct in Brooklyn. Andy Samberg stars as NYPD Detective Jake Peralta, a talented but immature recruit with the highest arrest rate in the precinct. 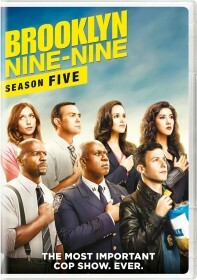 In this season, Jake and Holt (Andre Braugher) attempt to take down a fugitive despite being in a Florida witness protection program, Boyle (Joe Lo Truglio) attempts to connect with his adopted son and with the precinct under threat of closure, it's left to Gina (Chelsea Peretti) to save the day.